Today I am here with Rayron Gracie, Rayron is a blue belt and he is the son of Ryan Gracie who is one of the biggest legends in MMA. Last year Rayron won the worlds as a juvenile and he is 16 years old and already 6’3 and 230 lbs! He has everything he needs to be one of the biggest legends in the world. He is young and very ambitious. Rayron was visiting my academy in Bedford, MA and he is going to show us one of his favorite positions. He is going to show us how to counter the dog fight/half guard sweep. It’s funny because the sweep his is showing the counter to is one of my favorite sweeps in the world. Anyways guys lets take a look below and then I will breakdown. Okay guys so as you can see above he is countering this position I use a lot where I come up from the half guard to try and get the takedown. Rayron is super good at stopping this position and I can tell you because I have trained with him a lot. What he is doing is very simple but he is very good at this because he knows exactly what I am trying to do. Since he knows all of the things that I have to do, it is very easy for him to stop. The first thing he does is get the whizzer and the grip, after this he controls my sleeve and does almost like a hip throw to get me back down. When he is pushing into me to stop the takedown he knows I am going to try to roll him over, so before I even get to try he is already sprawling and it is stopping my sweep. Rayron is crazy tough to get from the half guard. 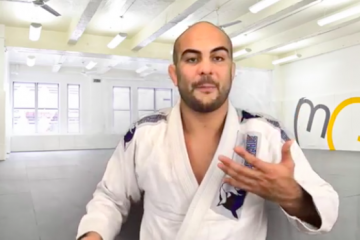 Anyways guys I hope you like this position and that it helps you stop the half guard sweeps, if you have not already download my FREE e-book because I go over a lot of questions that people ask me at seminars and online. OSS!